The HQ Monaro was the first iteration of the second generation of what is arguably one of Australia’s most iconic automotive monikers. First introduced in July 1971, the HQ was a highly successful model for the Iron Lion, and production ran through to September 1974 before being replaced by the face-lifted HJ. Engine choices for the HQ included a 2.8lt straight-six, 3.3lt straight-six, 4.1lt V8, 5.0lt V8 and a 5.7lt V8. Drive was sent to the rear wheels via a choice of a three-speed manual, four-speed manual or a three-speed Trimatic automatic transmission. The Monaro was made available to customers in a number of different specifications: the standard Monaro, the GTS, the GTS 350 and the Luxury Sport (LS). The HQ Monaro was also the first in the models history that could be had in sedan body style. The sedan could optioned in either GTS or GTS 350 spec. This HQ Monaro is an October 1971 build vehicle with the LS pack, 4.1lt V8 and the three-speed Trimatic gearbox. According to the seller, the HQ has a very low 55,000 original miles on the clock from new and has only travelled 5500 miles in the last two decades. The seller adds that the vehicle has been very well cared for and maintained, with the HQ undergoing a complete drivetrain overhaul in 1995/96 and a respray in factory Amethyst Metallic in 2000. 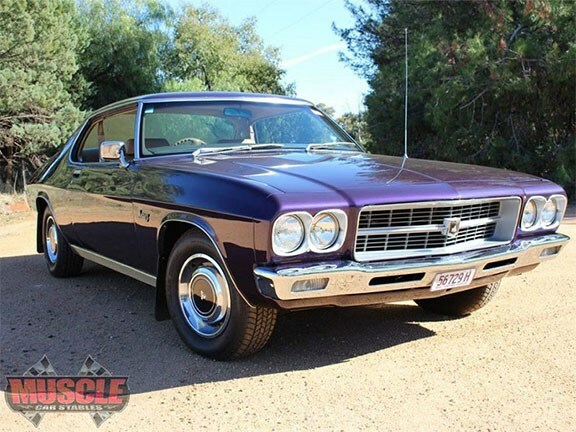 The HQ LS is $76,990 and anyone interested in this purple Aussie gem can view the full listing here.